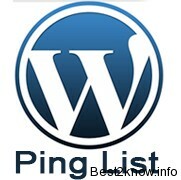 After been posting lot about thesis i m back again to WordPress and will give you a big Ping list. I have been asked by Many Bloggers or fellas why you are using Blog instead of a Website. The main reason is that Websites are not every well indexed by the Search Engine and the Blogs whether its self hosted or not a Self hosted blogs gets indexed.Pinging is good habit it tells the Crawlers that you have published some stuff so they come and Crawl your website. This is quit too big Ping list. i know that but don't use all it will slow down your Blog and you will surely won't like your blog loading slowly. Now will add the acquired ping list in WordPress. As i already told above that when ever you edit , update or publish a Post WordPress automatically pings to the website you have added in ping list.but be careful more pinging will result that website to to ban gradually it will result in Drop in your SEO.